With the DoneEx XCell Compiler you can use two approaches for excel workbook copy protection: a software based Registration And Licensing Tool approach as well as hardware dongles (USB-sticks). 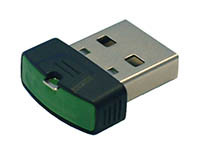 With hardware dongle approach, the license is linked to a USB dongle and only the one with the dongle can use the protected spreadsheets. For anyone else the spreadsheets are locked. You need to decide which dongle best fits your needs. In cooperation with Microcosm we have made the solution for hardware-based Excel workbook protection from unauthorized usage and copying. Download and install DoneEx XCell Compiler. Compile your workbook with the option “Save into internal storage (XSTG file)” selected on XCell Compiler compilation form. Order the Microcosm Dinkey Pro dongles and SDK. A free trial is available. Install the Microcosm Dinkey Pro SDK. Run DinkeyAdd and apply the Shell Method of protection to your compiled workbook. Download and install the DoneEx XCell Compiler. Compile the Excel workbook (XLS file), the result is a MS Excel file in EXE format. Download the Matrix Mx-Crypt tool. Extract and install the Mx-Crypt tools. You can copy these tools to a memory stick or any data storage device. Start Mx-Crypt, load the Excel-EXE-file and click on the “crypt” button – which encrypts the EXE and links it with the Matrix dongle. Since you don’t have a dongle, this is only a test. Now you need the USB License Dongles. Matrix recommends the type MLU-60. Here is the Matrix price list. For any license you need at least one dongle. You can make your own customized license arrangement with consideration to all future possibilities and updates. With the protection of secured operational data as well as the prevention of unauthorized data manipulation, you receive the highest level of protection. It is possible to link many files to one dongle license. You can set up to 79 additional 10-digit keys in a single dongle. Your license allows you to copy the protected spreadsheets to various computers but only the computer with the dongle is considered a valid license. The dongles work on any computer; just plug and play without software installation or drivers. For both, XCell Compiler as well as Mx-Crypt, free Trial versions are available. For XCell you need to buy a license which meets your requirements; for Mx-Crypt, you need to buy as many dongles as you need for your licenses.